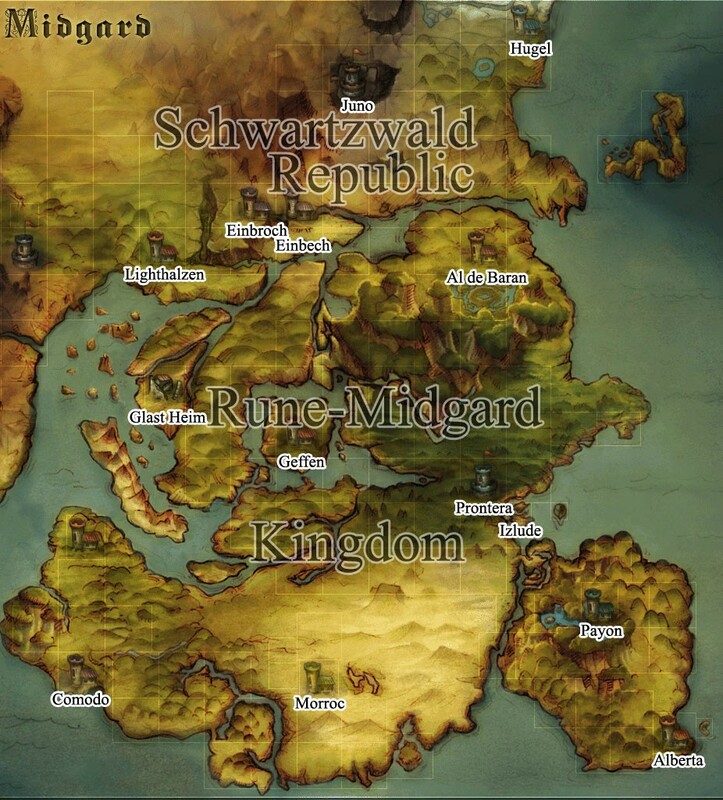 The Rune-Midgard Kingdom is fully half of the known world. It is a semi-traditional fantasy land of sword and sorcery. The kingdom is a form of monarchy, and the current king is Tristan Gaebolg III. The kingdom's religion is the Odin Orthodoxy. There are seven families eligible for the throne, as per the legend of Jormungand in which seven valiant warriors defeated an evil monster snake that wanted to eat the world. Most of our story will be told in the Rune-Midgard Kingdom. By the way, in-game the kingdom is called "Rune-Midgarts" but it sounds silly, so I went with Rune-Midgard instead. Also in-game, alcohol is illegal by Tristan III's decree, but not in the comic. That's just silly. There are several branches of the Odin Orthodox Church. The first and main branch is in Prontera, but there are other branches in each main city. They are independently led, so the policies may not be the same in each branch. Similarly, there are three branches of the Knights' Guild: Prontera, Al de Baran, and Geffen. Each branch is led by a figure called the Knightmaster, who is granted the position by the king.